Sepsis is a life threatening illness that has been much in the news lately. 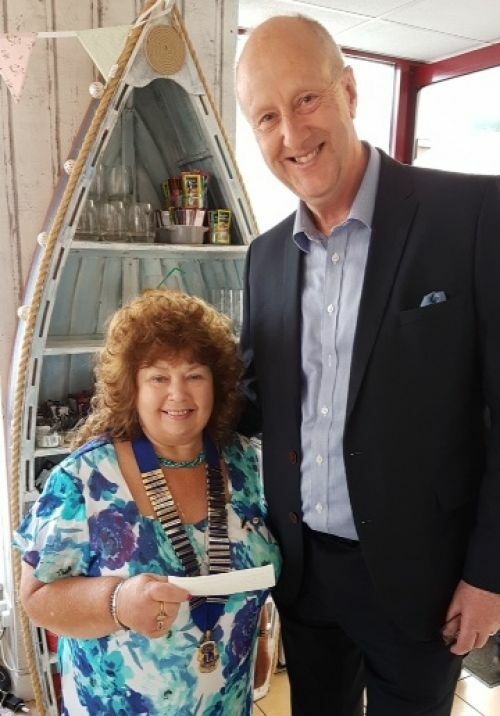 Swanwick Lions President Helen Mitchell suffered from sepsis a couple of years ago, and during her tenure as President, the Club made the UK Sepsis Trust their main fund raising target. Thankyou to all who helped us collect the donations and to all who donated. 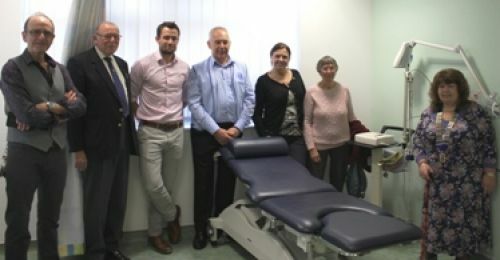 At the end of July 2018, the Club were pleased to present a cheque for £3,000 to local GP Dr McFarlane. We are writing to thank you for the donation of £3,000.00 received by the UK Sepsis Trust from the Swanwick Lions club, Hampshire and forwarded by Dr McFarlane of Brook Lane Surgery. Thanks to help from advocates and friends like you, UKST has seen public awareness of sepsis in the UK rise from 34% in 2010 to 70% in September 2016 - 42.7 million more people have now heard of sepsis as a result of our work. Your support is helping us to facilitate earlier identification and treatment of sepsis across the UK, which could save 14,000 lives every year. On behalf of all those battling the terrible consequences of sepsis, thank you once again. July 14th- Swannmore Fete is organised by Meon Valley Lions, and we had a marquee with Games and Books. The day was sunny and HOT, with many people spending time in the shade of the Tea Tent and Bar area. The Birnie Boozle Band also supported us by playing several sets of traditional melodies. Sarisbury Green Fete June 9th;- On a warm day with sun & clouds, the Green was crowded with visitors to the Fete. The Lions BBQ did a roaring trade, and only stopped cooking late afternoon when the gas bottle ran out!! Thank you to Tim Cooper and all who helped run the BBQ. Our other stalls did well, and the proceeds will help our Charity Fund. The Birnie Boozle Band played all afternoon, and proceeds from their collection will be added to our UK Sepsis Trust Fund. Barry was a member of Swanwick Lions Club from 2002-2005. He passed away in early June, after being diagnosed with a brain tumour. His funeral was held on Monday June 18th, at St Marys Church in Warsash. Contrary to his own wry observation that his funeral ‘could be held in a telephone box’, the Church was overflowing. Along with Tina his wife, and immediate family and relations, people came from all walks of life: people he had known throughout his life, people from organisations he was a member of, and people whose lives he had touched in some way. He played a major part in the manufacture of the Lions Christmas sleigh, which was built in 2004, welding together the entire steel framework. After leaving the Lions due to his many other commitments, he still helped out during our Sleigh collections. Our President for 2017 - 2018, Lion Helen, nominated the UK Sepsis Trust as her Charity for her year. So far, our Christmas Sleigh collection, Easter Egg Raffle and other activities have raised over £2,000. Our Christmas Sleigh collections supported the UK Sepsis Trust. The Hub opened this year, and Swanwick Lions helped with the donation of £3,000 for medical equipment. We supplied a £2,000 ECG machine, trolley, and equipment, with a further £1,000 for other items including a nebuliser and 8 blood pressure monitors. -Is it an emergency?- patient to dial 999 or attend A & E urgently. - depending on the health issue the 'same day access service' is offered at the Fareham Community Hospital. If a patient accepts the offer, a clinician from the Hospital 'Hub' will call the patient to discuss. The Hub is manned by Doctors and Nurses from the GP surgeries who operate a rota system. In addition to this service, NHS consultants also see patients at the hospital, saving a journey to Q.A. Hospital. The purpose of the new system is to enable FCH to play a major role in the health of the Community, by reducing the waiting time for patients to see a Doctor or Nurse, and reduce the number of patients filling GP surgery waiting rooms. The service is being implemented by committed NHS doctors and managers, and currently takes 200-300 calls a day. It is hoped that all local GP practices will join the scheme. Swanwick Lions are delighted to see the new service is doing so well – and equally delighted that the equipment we were able to provide is playing a part in the success story. The 28th annual duck Race on Bank holiday Monday was a great success. Crowds lined the riverbank at Mansbridge as over 2,500 plastic ducks were dropped into the River Itchen. It was a real holiday atmosphere, as a glorious,warm afternoon saw people out picnicking and walking in the park, canoeoing and swimming in the river, and enjoying ice-creams. Congratulations to the holder of the 1st duck over the line at Woodmill, who won the £250 prize. Autumn 2016:-Newsletter_Autumn2016_published.pdf 2016...................................................... The Southampton Solent Lions and Swanwick Lions Grand Annual Duck Race went off with a splash on Bank Holiday Monday!! A beautiful and warm day brought out the holiday crowds to watch the thousands of plastic ducks dropped into the river at the old Bridge at Mansbridge. Thankyou to everyone who bought tickets, to all our helpers, and to the businesses who donated prizes. 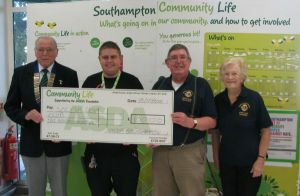 Matt Murphy, who is ASDA's Community Champion for their Southampton Marlands Store, made the presentation on behalf of ASDA's Community Fund. The £100 is a donation toward the money raised by the Lions Duck Race held at Woodmill on August Bank Holiday Monday this year. The Duck Race is a joint venture between the Lions Club of Southampton Solent and the Lions Club of Swanwick and was held for the 27th consecutive year in 2016. Every penny of the money raised will be used to help people in our local community who are less fortunate than ourselves. Several of the Duck Race prizes were donated by ASDA and we are very grateful for the help and support given to us by them. Copyright © 2005 - 2019 Lions Club of Swanwick. All rights reserved.